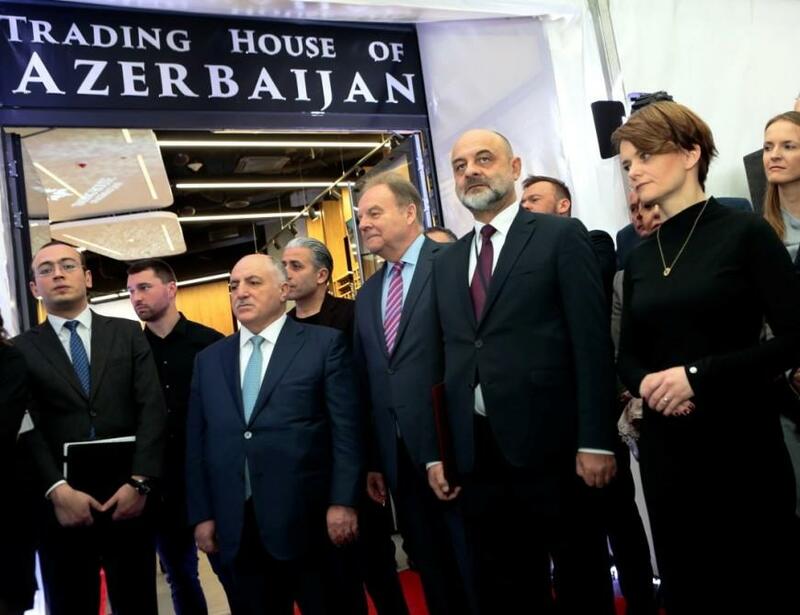 The opening of Trade Houses is one of the important activities carried out within the expansion of the export of Azerbaijani products and promotion of the ‘Made in Azerbaijan’ brand. 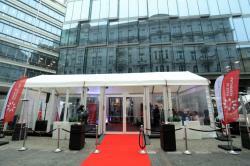 Next Azerbaijan Trade House has been opened in Warsaw, the Polish capital, on December 6. 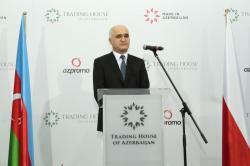 Azerbaijan Trade House, established by the Ministry of Economy, promote export of Azerbaijani products, organize sales of local products in Poland, and coordinate these activities with entrepreneurs. 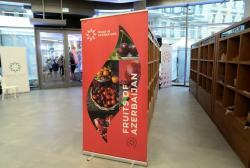 An exhibition of various products of Azerbaijani companies, organized at the Trade House covers about 30 Azerbaijani products such as alcoholic drinks, dried fruits, pomegranates, hazelnuts, tea, jam, fruit juices, mineral waters and cosmetics. 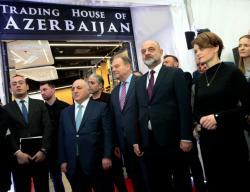 A delegation led by Economy Minister Shahin Mustafayev, officials and businessmen from Poland took part in the opening of the Trade House. Speaking at the event, the minister said that in 2017, the trade representative of Azerbaijan in Europe was appointed in Poland. He emphasized that in the first nine months of 2018, the trade turnover between the countries increased by 57 percent. So far, Poland has invested over $ 20 million in Azerbaijan, while Azerbaijan’s investments in the Polish economy amounted to $ 6.5 million. Currently, there are 21 Polish companies operating in services, industry and trade in Azerbaijan. 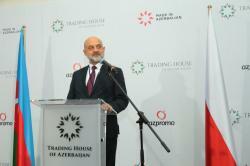 Polish Minister of Entrepreneurship and Technology Jadwiga Emilewicz and Deputy Foreign Minister Maciej Lang noted that the opening of the Azerbaijan Trade House in Warsaw is an important step in the development of bilateral economic relations, highlighting the importance of developing economic cooperation and business relations between the two countries and shared their views on expanding them. Then, the Ambassador of Azerbaijan to Poland, Hasan Hasanov underlined the importance of expanding economic ties and invited businessmen to take advantage of this opportunity. 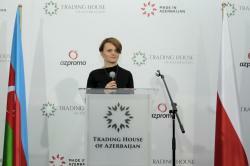 The participants of the event got acquainted with the Trade House and the exhibition of the Azerbaijani products. A Memorandum of Understanding on the sale of hazelnuts and concentrate of pomegranate juice was signed between the Trading House of Azerbaijan and the Polish company STX ONE. In 2017, Poland became the fourth biggest trading partner of Azerbaijan. Trade turnover between Azerbaijan and Poland in 2017 amounted to $77,8 million. 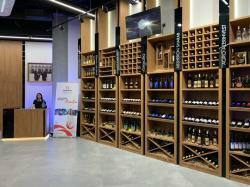 Azerbaijan imported goods worth $ 69 million from Poland, while Azerbaijani exports to Poland totaled $ 8.7 million. Azerbaijan was identified by the Polish Ministry of Economic Development in 2017 as one of 22 most promising markets for Polish companies globally. Poland is the sixth largest market in the European Union with rapidly growing economy – in 2017 GDP growth was 4.6 percent and forecast for 2018 is 3.8 percent. 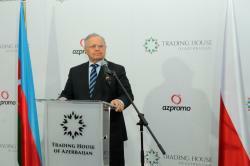 In addition to Poland, Azerbaijan's Trade Houses are also operating in Belarus, Ukraine and Latvia. It is planned to open up to 10 Commercial Houses in 2019. 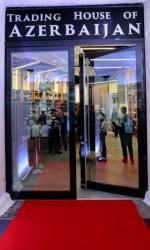 Several trade houses will be opened in Russia and some in China. 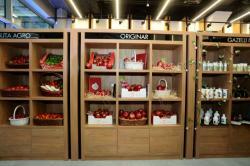 The Made in Azerbaijan brand, established in 2016, envisages a large-scale promotion of local non-oil products in foreign markets. Promotion of export-oriented local products under the Made in Azerbaijan brand in a wider geographic area also helps to attract foreign investment and further strengthen the non-oil sector's share in the structure of the GDP.